In collaboration with International and local organisations, FiberGuide offers a range of training courses in optical communications. 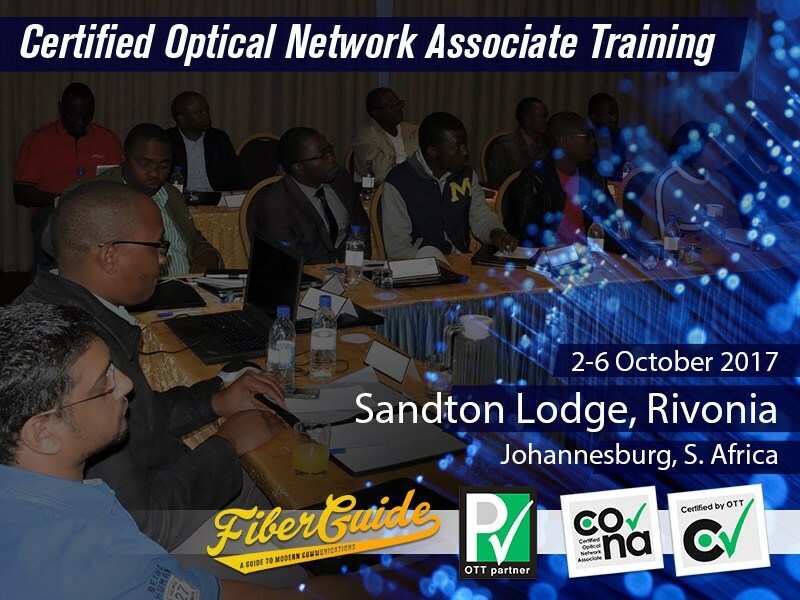 FiberGuide recently announced that their next training event in Africa will take place at the Sandton Lodge in Johannesburg, South Africa, from October 2 through October 6. The course is Certified Optical Network Associate (CONA). The South Africa training event will be organised in collaboration with TransAfrican Fibre Services (TAFS), an independent fibre optical services company servicing the fibre industry in South Africa and the African continent. Through TAFS, CONA is approved by the Media, Information and Communication Technologies Sector Education and Training Authority, the MICT SETA. SETA registered companies sending their trainees to this event will be eligible for SETA Mandatory Grant Refund. Developed by UK based Optical Technology Training (OTT), CONA is specifically designed for network engineers, transmission engineers, network planners, project managers and other professionals in related roles. Those with interest in long distance networks, metro networks, mobile backhaul, dark fiber, enterprise wide area networks, and data center interconnects will benefit the most from the course. The course focuses on SWDM, CWDM and DWDM at 10Gbps and 25Gbps per channel. CONA is a pre-requisite for CONE which focuses on more advanced topics such as coherent detection, flexigrid, polarization multiplexing and other higher data rate (100Gbps and beyond) related concepts. “Since some of the most sophisticated optical communication networks in Africa are being deployed in South Africa, such as that based on Infinera’s 500 Gbps FlexCoherent technology, South African engineers and managers will benefit the most from OTT optical networking training courses”, said Dr. Jabulani Dhliwayo of FiberGuide. “In a continent in which most critical fiber optic networks are developed as turn key solution by foreign vendors, indigenous professionals risk failing to influence the impact of network planning on overall cost of ownership, long term bandwidth demand, longevity, and the society if they lack the relevant knowledge”, continued Jabulani. Based in Fairfax, Virginia, FiberGuide is a fiber optic training and data center and WAN consulting company. Our training in advanced optical communications targets engineers and managers from telecommunication operators, service providers and enterprises. FiberGuide facilitates optical communication training through pre-scheduled classes or custom corporate training. When companies prefer a training setting where their employees can discuss specific requirements openly in the absence of potential competition, a custom training session may be an option for which we can deliver the course at the corporate location. FiberGuide is also a one stop gateway to thousands of colocation data centers and wide area network solutions. We leverage our expertise, state of the art software, a large up to date database of thousands of colocation data centers across the globe and an extensive global fiber optic maps from our partner providers to support IT managers interested in server colocation and WAN solutions.